Professional Healthcare Services’ (PHS) goal is a focus on patient independence and to enable our clients to remain in their own homes. 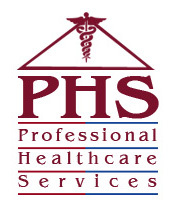 PHS provides Home Health Care nursing services post hospitalization, post surgery, or for those facing a health care diagnosis requiring a change in lifestyle. PHS provides physical therapy in partnership with CLOSE PHYSICAL THERAPY. Physical therapy services will include rehabilitation from surgery or injuries, strengthening and respiratory physical therapy. Our primary goal is to provide professional, compassionate quality care and, at the same time, do this in a fashion which insures maximum independence, self respect, and dignity in a non institutional setting. Our focus on home and home health care is unconditional as we know the value of one’s own surrounding and its’ familiarity and comforts. “There’s no place like home”.